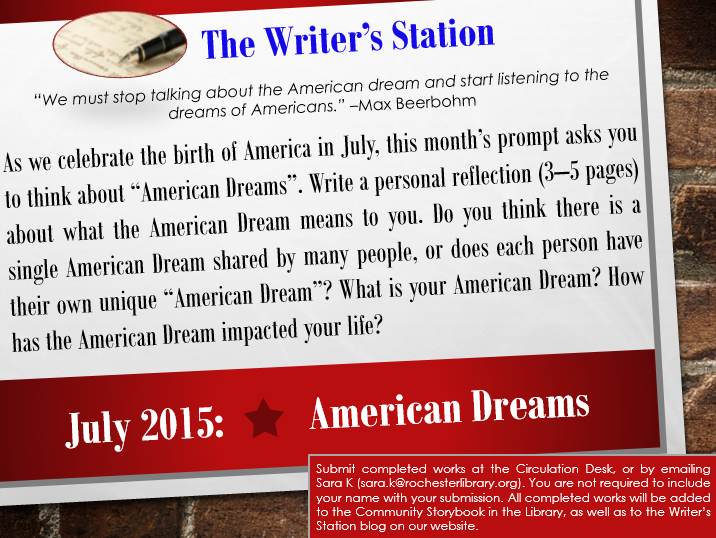 As we celebrate the birth of America in July, this month’s prompt asks you to think about “American Dreams”. Write a personal reflection (3-5 pages) about what the American Dream means to you. Do you think there is a single American Dream shared by many people, or does each person have their own unique “American Dream”? What is your American Dream? How has the American Dream impacted your life? Submit completed works at the Circulation Desk, or by emailing them to Sara K (sara.k@rochesterlibrary.org). You are not required to include your name with your submission. All completed works will be added to the Community Storybook in the Library, as well as to the Writer’s Station blog on our website.